When school is cancelled early because of a snow storm, Scotty's first worry is that his big game that evening will be cancelled. 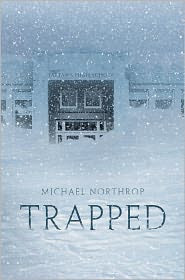 But when he and six other kids find themselves trapped at the school in the middle of an incredible blizzard, things take a more serious turn. By the time their tale of survival has drifted into days, events have grown fatal. What develops is classic disaster novel stuff, but told through the lens of a group of resourceful teens. This isn't a very touchy feely book, focusing more on the action than the books I normally read, but there is a certain amount of male posturing and psychological drama. In addition, some intimations that a romance might develop are factored in, but as Scotty himself says, this isn't a boy-meets-girl story. What it is is a pretty decent adventure story with a group of fairly believable teens, who make a couple of decent choices as well as a fair share of stupid decisions. It all seems in character. The novel is hardly earth-shattering, but it's entertaining. Northrop knows how to keep the pace up and ratchet up the suspense. The ending comes on a bit sudden but it's satisfying, even if not terribly deep.